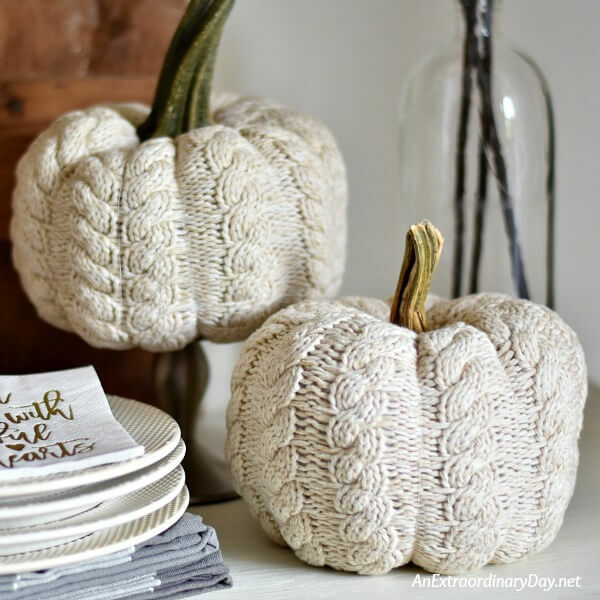 Fresh ideas for creating a rustic fall farmhouse vignette that is simple and full of texture and charm. This post contains affiliate links which help support this site at no additional cost to you when you make purchases through those links. The other day my husband came home from work and after he kissed me as he always does when he comes in the door, he turned and walked towards our little dining nook. I had just finished styling the console table there for fall along with a simple setting for two on our table. I was so happy he noticed the change. But it was his response that totally got me. I don’t think that he could have said anything that would have warmed my heart more. Truly it’s got to rate among the very best compliments he has ever given me. This last year I have worked at making our little apartment a home with mostly thrifted items. Yet at the same time, it’s forced me to be creative. Not a bad thing. I’ve always said that creating a beautiful home is important. And even more important, creating a peaceful sanctuary for your family. When Tim said the dining space looks like us... at that moment I knew that I had created, in some small way, a place of beauty and sanctuary for him to return to in the evening so that he feels he’s come home. It may not be the house we hope to have again or all the things we have in storage so many states away, but it is our home, right now. Through all of the changes and moving we’ve done… this most reminds Tim of us when we dreamed together and had a new home built… a modest 1620’s style New England saltbox. Over the years I have become less “Shaker” and more vintage… if that makes any sense. It sort of just happened with moving to homes of completely different periods… a 40’s prairie style, 70’s ranch, 60’s split level, 50’s cape cod. And over that time decorating trends changed and I inherited some furniture with a Victorian look and that sort of morphed into a vintage decorating style except in my kitchens which somehow retained more of the “Shaker” look I originally loved. It’s kind of confusing really. Here I am in this little apartment trying to find my style with thrifted items, that are again, a bit more vintage, and I have this huge realization that my husband feels more at home with farmhouse style decor. I’m processing all this right now as I tap on the keys of my laptop. How does this realization affect my decorating decisions? What tweaks do I need to make? Tim says he could live anywhere… he doesn’t need much. But, in my heart of hearts, I believe he does need the place we call home to look like US. How I styled this console table to create a cozy fall farmhouse vignette. Actually, I should probably call this a fall cheapskate vignette. Let’s start with the console table. It was free… and it seems… the longer I have it and photograph vignettes on it the more crooked it seems to be. But… it was free. And when something is free and it looks good when given a light coat of chalky paint…. all is good. The next big player is the small rustic wood door. My husband was helping a builder friend do a little demo and he came home with that door for me. Yeah. I use it constantly and I LOVE it. Oh… again… it was free. That grapevine wreath adds more natural rustic charm and texture. I use this Walmart find often on the rustic door when styling vignettes. It set me back about $4. Hanging across the front of the wreath as some fun fabric letters spelling out the season. I picked up this banner for $3 at the Dollar Spot. The nearly white letters are perfect as they create a bit of drama, whimsy, add graphic interest, and repeat the color of the console table. Repetition is so important to achieving a cohesive look in vignettes. The letters were originally strung on heavy white string, but I changed that out for some rustic jute which I like much better. The tall clear bottle in the back was found at a local thrift shop nestled inside a wicker sleeve basket. I removed the basket for this vignette as it created more of a modern farmhouse look I was seeking. This is a $4 find I have really enjoyed using this summer for displaying a single sunflower stem. Right now, it’s holding the three floral stems that remind me of Pumpkin on a Stick Eggplant . Those stems were a grand find at the Dollar Tree for $1 each. Surely they would be at least three times that at the Hob Lob. You’ll notice that I curved the stems a little and nestled them around the top of the wreath as well. I did not have much for fall on hand, but I did keep these sweater pumpkins that I created tucked away for a return appearance. I still love their neutral color and the texture is perfect for adding a bit of warmth and coziness to the display. One of them is raised up with a small simple pewter candlestick I picked up at the thrift store for $1. It’s important to move the eye around and risers of various kinds, even books, will help to provide the necessary height changes for visual movement. Front and center I placed a stack of dessert plates on top of some tea towels that I hope to trim and sew for napkins… or maybe they’ll just end up being large napkins. These were a find at Meijer. I cannot figure that store out. They really should pay someone to better merchandise their goods. Not only are decor items mixed around the store, some things end up on the clearance endcaps when I’ve never even seen them previously. Sometimes that’s good a thing… like this time when I picked up these towels for $2.19 each. I’m not usually drawn to gray, but these were a very nice quality towel and I needed a soft neutral tone and texture to go with my new modern farmhouse tiered tray. The dessert plates were a huge saving at Hobby Lobby back in the early summer when they were changing seasons. At 90% off I think they were $1.09 each. Again, very neutral, a bit heavy, but big on texture and perfect for this vignette. I topped the plates with dessert forks and small napkins that I picked up at HomeGoods for $2.99. The napkins are not white, but a very pale greige with gold embossing and the perfect sentiment. With all the silver and gray tones… I love the surprise of a bit of gold. And then we’ve finally come around to the…. Yes, I made that! three tiered tray. It isn’t perfect, but I’m so pleased with how my farmhouse tray came together. I put together a tutorial so you can create your own… click on the link>> modern farmhouse tiered tray. 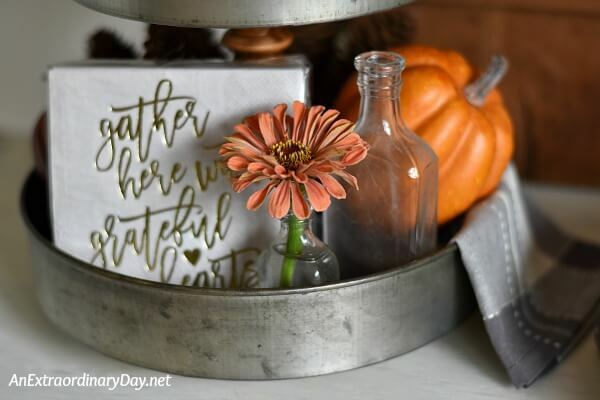 A tiered tray is fun and a wee bit challenging to style for fall. I was doing this a bit early and small fall-ish items were hard to find. I ended up at Walmart where they had this cute owl which I splurged on for $3.99. The owl provides the bit of whimsy that gives life to the styled tray. I also picked up two 99 cent pumpkins. I really wanted white pumpkins… they had some… but they were quite yellow and I didn’t want to take time to paint them, so I went with these. In the end, I’m quite happy with them. They repeat the colors of the zinnias and the pumpkin on a stick eggplant. Plus, I know that not everyone enjoys a monochromatic neutral fall look. One thing I knew for sure was that I needed some small items and I wanted to put fresh flowers on my tray. My second big splurge was a mixed bag of vintage bottles, nine for $5 at another thrift store. They give another texture and are perfect for holding the fresh blossoms I picked up at the farmers’ market for 50 cents each. Zinnias last a long time, so that ends up being a good value. I look forward to having lots of fun with the assorted bottles next spring and summer as little vases. I rounded out the tray with more of the napkins, pine cones I collected, and saucers from my set of vintage dinnerware. Many of these items were acquired over the course of spring and summer. Styling does take resources. If you are blessed to be able to shop your home for what you need… that’s the best. If you don’t have much to work with… like me… you may need to spend a little money. Considering that I have already used some of these items previously and will again, my $30 investment over time is pretty small for such a big bang. And in the end… every penny was worth it to get that compliment from Tim, wasn’t it? To complete the dining area, I set up two table settings and placed a small metal vase of alstroemeria on the table for a centerpiece. I’ve enjoyed having the table set up that way, so when it’s meal time, I just pull off the table settings, reset the table, and place them back after the meal. It may seem silly, but I love seeing everything complete like that. I guess it’s just a small way to make this place feel like home. Do you like the vignette as much as we do? I hope you’ve been inspired…. I’d love to hear how. If you enjoyed this post, please use the sharing buttons to let your friends know and “pin it,” too. I have not “been around” you long enough yet to know if it looks like you, but it is lovely and very cozy. Very home warming and welcoming. Thanks, friend… you do know how to say the nicest things. It’s interesting that you’re adding in grays and blues. Not so much gray for me… but I am seriously considering a move toward blues… denim/navy especially. I know you’ve loved your reds, so that is a big change for you. Glad to hear you’re enjoying painting things too. Isn’t that just so rewarding? That is a lovely compliment. I could change stuff up around here and my significant other would not notice. Now, if I forgot to fix supper or moved his recliner…..You’re lucky to have someone who notices your efforts. If not, I know that I did something creative and that fills a hole in MY soul! Your fall colors are lovely. One thing I don’t like about farmhouse style in the monochromatic-ness of a lot of it. To me, black is only an adjunct for turquoise, purple, fushcia, orange, etc. Earth tones are seldom in my vocabulary! Your use of color is subdued, not absent–important for the serene quality it has. Nice job! Kathy, my husband doesn’t notice everything. I wish he did… like a few weeks ago when I cut my hair and looked great when I met him for a cocoa and dessert date. A few weeks later my neighbor girl said, “You cut your hair, didn’t you?” and he looked at me and said, “When did you do that?” BUT… this time he DID notice and combined with his comment I totally got the message. 🙂 I like your assessment of the modern farmhouse style, Kathy. I personally always need a wee bit of color… not too much… though I have an upcoming post where I went crazy with sunflowers… well for as long as they last. 😉 Thanks for your kind comments and for popping by. Hope your weekend is extraordinary! I think that another reason he likes it because it feels finished and everything else is mid-transition… which is what it is right now. Hopefully, things will change a little bit in the rest of the apartment, soon. Gwen, I LOVE your ideas for the vase. Funny thing about comparison… we can be good for days… weeks.. years… and then one day when we’re not looking we get caught in its trap. I’m sorry. You really did have all your hopes and dreams dashed in a moment. But, my friend, you still have an amazing way of blessing others, inspiring, encouraging, and drawing people to Jesus and that, my friend, is something BIG. Kathleen, I do feel very blessed. Along the way, I’ve had to put into practice the idea that it’s my outlook that makes all the difference and I can choose what it will be. Thanks for your kind words. I’m totally enjoying the pumpkins and the new tiered tray. Yup… it feels like home! This is so beautiful. I love how you shopped your apartment/home for your fall decor. Each part adds so much charm and warmth. Blessed you are to have a husband who not only notices but appreciates the time and effort and creativity you put into making each of your dwellings a HOME. I can relate as being married to a pastor, funds have always been tight. We laugh that we probably only own 3-4 pieces of furniture in our whole home that were new. Everything else is thrifted and repurposed – sometimes repurposed several times over depending on what we needed at the time. I’m grateful that my husband has always voiced his appreciation for how I care for the home. In fact, last night when we were eating, he commented that the bedroom “re-do” I’m just finishing is the prettiest thing I’ve ever done and how much he loves it. I can also relate to seeing what others have and comparing what you have. We were just at the home of friends and when I came home, I was feeling very critical of OUR little home lol. I love your 3-tier centerpiece — that little owl, the flowers, pine cones — all SO pretty! You’re very talented indeed! Lauren, you are so sweet. My husband is a displaced pastor, which is why we’re living “in between” in this little apartment. It was a big unexpected twist… but God has brought us through some very difficult days. I love that your husband is so encouraging and notices what you’ve done. Sometimes I think there is more joy in making something from what is available than purchasing new. Of course, there are exceptions, like upholstered furniture, but everything else can be an opportunity for creativity. I’m so glad you stopped by. Thanks for taking the time to share. It all looks beautiful and to receive that compliment from your husband – priceless! I do adore your little wooden door – it really adds a farmhouse touch! I agree that it’s important to make the place you live feel like home whatever that means to you. Thanks for sharing your heart-warming story. It reminded me of the importance of making home feel like home to all who live there – not just me. Congrats! I’ve featured you on today’s Vintage Charm Party #101! Thank you so much!!! What a delightful surprise! I came to see the sweater pumpkins… and I stayed to be warmed by your lovely style. With words, and with decorating. I think I found a new friend! Dorothy… You just made my day!! Welcome! I’m honored that you visited and stayed… wish we could sit down over a cup of chai and get to know each other in person.